The lung extractor is designed for removing lungs and blood clots from the inside of a poultry carcass. The lung extractor is constructed of stainless, acid-resistant materials and standard pipe fittings. 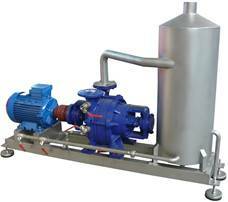 It is activated by switching on a vacuum pump. After appropriate vacuum level is obtained, work with guns can begin. The stainless gun end is inserted inside the carcass, the trigger is pressed and lungs, blood clots, water and other evisceration leftovers are extracted. Offal sucked by the guns is collected in the working container, from which it must be removed from time to time. Offal is removed from the working container manually, through a release valve mounted in the bottom of the container. Depending on customer’s needs, the extractor may be equipped with adequate number of guns and pump with appropriate capacity, which results in the required capacity of the machine. For high capacities, containers larger than standard ones shown in the figure below should be used. 7. Release valve, 2 ½"
8. Release valve, 1 ½"